Brandon Jackson, a doctoral candidate in mechanical engineering at Michigan Technological University, has created a new computational model of an electrospray thruster using ionic liquid ferrofluid—a promising technology for propelling small satellites through space. 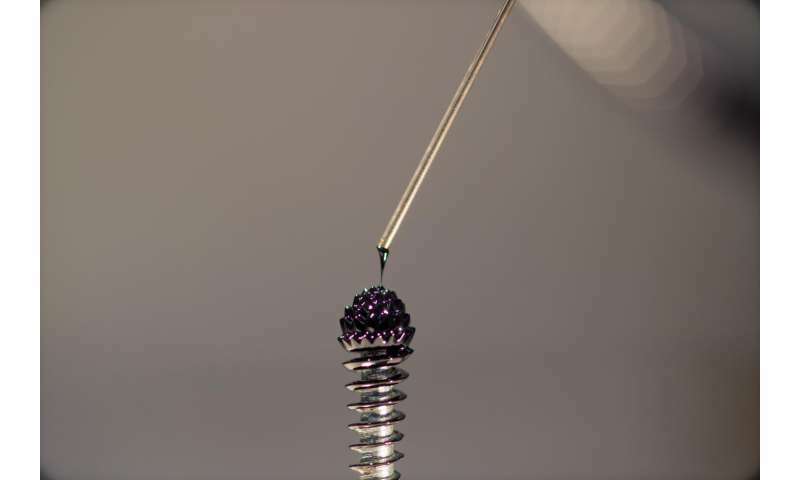 Specifically, Jackson looks at simulating the electrospray startup dynamics; in other words, what gives the ferrofluid its characteristic spikes. He is the lead author of a recent article in Physics of Fluids, "Ionic Liquid Ferrofluid Interface Deformation and Spray Onset Under Electric and Magnetic Stresses". More than 1,300 active satellites orbit the Earth. Some are the size of a school bus, and others are far smaller, the size of a shoebox or a smart phone. Small satellites can now perform the missions of much larger and more expensive spacecraft, due to advances in satellite computational and communications systems. However, the tiny vehicles still need a more efficient way to maneuver in space. Scaled-down plasma thrusters, like those deployed on larger-class satellites, do not work well. A more promising method of micropropulsion is electrospray. Electrospray involves microscopic, hollow needles that use electricity to spray thin jets of fluid, pushing the spacecraft in the opposite direction. But the needles have drawbacks. They are intricate, expensive and easily destroyed. To solve this problem, L. Brad King, Ron & Elaine Starr Professor in Space Systems at Michigan Tech, is creating a new kind of microthruster that assembles itself out of its own propellant when excited by a magnetic field. The tiny thruster requires no fragile needles and is essentially indestructible. "We're working with a unique material called an ionic liquid ferrofluid," King says, explaining that it's both magnetic and ionic, a liquid salt. "When we put a magnet underneath a small pool of the ferrofluid, it turns into a beautiful hedgehog structure of aligned peaks. When we apply a strong electric field to that array of peaks, each one emits an individual micro-jet of ions." The phenomenon is known as a Rosensweig instability. The peaks also heal themselves and re-grow if they are somehow damaged. King came up with the idea of using ferrofluids for thrusters in 2012. He was trying to make an ionic liquid that behaved like a ferrofluid when he learned about a research team at the University of Sydney led by Brian Hawkett and Nirmesh Jain. 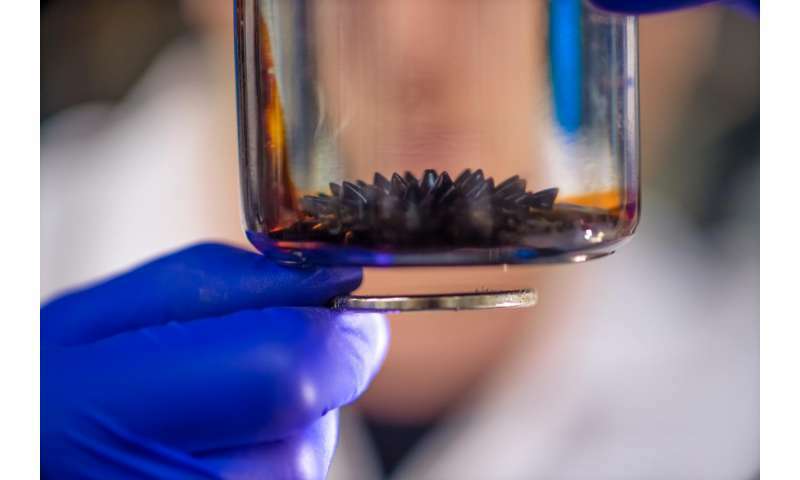 They had developed a ferrofluid from magnetic nanoparticles made by the life sciences company Sirtex. King's early work with the ferrofluid sample was pure trial and error; the results were good, but the physics were poorly understood. That's when the Air Force Office of Scientific Research (AFOSR) gave King a contract to research the fluid physics of ferrofluid. Enter Jackson, whose doctoral work is advised by King. "Typically among engineers, there are experimentalists who build and measure things, or there are modelers who simulate things," King says. "Brandon excels at both." Working in King's Ion Space Propulsion Laboratory, Jackson conducted an experimental and computational study on the interfacial dynamics of the ferrofluid, and created a computational model of ionic liquid ferrofluid electrosprays. "We wanted to learn what led up to emission instability in one single peak of the ferrofluid microthruster," Jackson says, who developed a model for a single peak and conducted rigorous testing to ensure the model was correct. The team gained a much better understanding of the relationships between magnetic, electric and surface tension stresses. Some of the data gathered through the model surprised them. "We learned that the magnetic field has a large effect in preconditioning the fluid electric stress," Jackson says, explaining this discovery might lead to a better understanding of the unique behaviors of ferrofluid electrosprays. The AFOSR recently awarded King a second contract to continue researching the physics of ferrofluids, and he says, "Now we can take what we've learned, and instead of modeling a single peak, we'll scale it up and model multiple peaks." Their next set of experiments will be more like a thruster, though a working thruster is still several years away. Although making 100 peaks or more, all thrusting identically, will be much more challenging. "Often in the lab we'll have one peak working and 99 others loafing. Brandon's model will be a vital tool for the team going forward," King says. "If we are successful, our thruster will enable small inexpensive satellites with their own propulsion to be mass produced. That could improve remote sensing for better climate modeling, or provide better internet connectivity, which three billion people in the world still do not have." The team has also begun collaborating with Juan Fernandez de la Mora, a professor of mechanical engineering and materials science at Yale University, one of the world's leading experts in electrospray. I'm not so sure it's wise to spray earth orbit with tiny ferromagnetic ions. Even if finely dispersed, they can clump up and become a hazard for other satellites. It sounds like a disaster in making, like the early idea of spraying a cloud of metal shrapnel into LEO to act as a radio reflector.